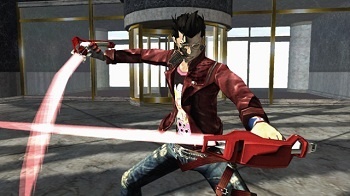 No More Heroes Creator Making Serial Killer Game? No More Heroes creator Goichi Suda is looking to team up with Suicide Club director Sion Sono for a movie adaptation. Suda, more commonly known as Suda 51, revealed in a recent interview that he sat down to dinner with Sono, whose work Suda said he is a fan of. "I told him how much he inspired me with his movies," Suda said. Sono, Suda said, responded in kind, and at that dinner he offered Suda a chance to make a game adaptation of his next film. What film will that be? In all likelihood, the game will be an adaptation of Cold Fish, billed as a true-life serial killer story. Suda 51 and Sion Sono are both known for works well off the beaten path, as well as ones that appeal to the otaku crowd. Suda pretty obviously cares about the source material, so this should at the very least be an interesting gaming adaptation of a film.